Isn't this just gorgeous?! and I love the matching tissue. 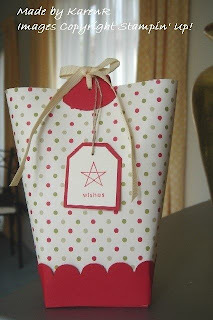 Tracy made this gift bag using two of my favourite sets Bundle of Joy and Nursery Necessities. 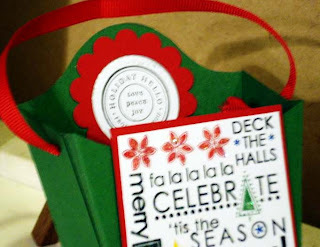 See what Tracy's been up to on her blog Stamping All Seasons. Karen has been very busy on her blog The INKredible Journey. 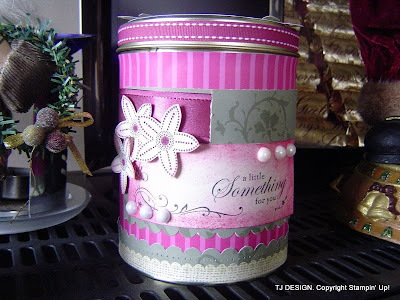 She's done a great job altering this coffee tin, and you should check out her candles. Tracy's made a beautiful job of altering this tin. 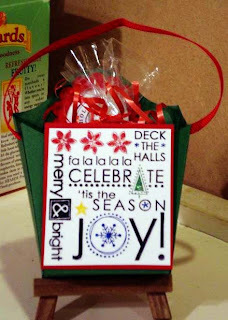 Check out more of Tracy's creations on her blog Stamping All Seasons. 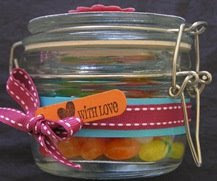 Here's one of the jars Michelle altered, I thought it was so cute I had to have a go. Check out Michelle's Blog to see what else she's been up to. I've been so slack updating this blog lately - so sorry to everyone who's been checking back regulary. Here's a couple of quick posts for the new challenge Anything Altered. I decorated up some jars for Christmas gifts. I loved using the Rub-ons and took the colors from various designer papers. 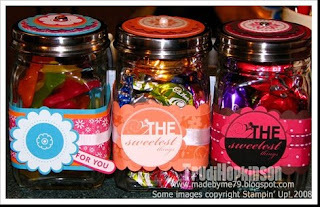 For more jars check-out my blog HERE. Things have been slow around here again I know. I've been doing night shifts at work and they tend to wipe me out a bit. If you think things are a bit slack here, you should see my house! Also we had a family friend pass away on Tuesday so have been pre-occupied with that as well. So today I'm planning on getting the house habitable again and will be blog hopping this afternoon to check out what you've all been up to and will be posting this evening. Angela has been very organised and already put together this calender for next year. These calenders are fabulous. 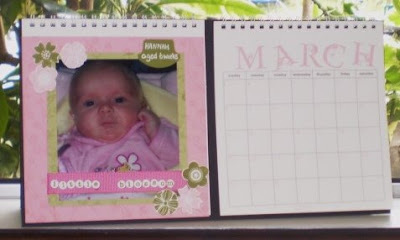 Not only can you display your layouts over the year, but once the year is finished you can put the layouts in a 6x6 Album. 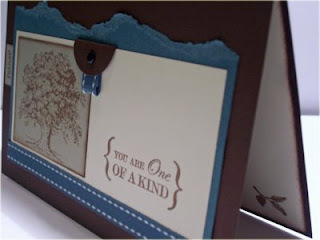 Check out a few more of Angela's gorgeous layouts on her blog HERE. This is Chloe's gorgeous Xmas project. The clever wee thing has used the cardboard sheet that comes in a packet of SU designer Paper! For more info check out her blog. Another morning where I should be getting organised and instead I'm here blog hopping once again! I happened to 'hop' onto this site and the wonderful Shelley has a 3D Inspiration Index where you can find instructions and templates for all her 3D items. Here's a layout that I managed to complete tonight. For the recipe and details check out my blog - Made By Me. Alana is a very talented Aussie demo. Check out her blog HERE. 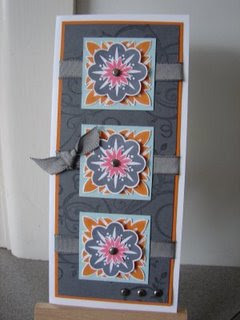 Here's Tracey's layout, for a close up shot of the flower checkout her blog Stamping All Seasons. Tracey's used DSP from the new Summer Mini (out from the 1st December). The papers in the new mini are gorgeous! What's Nic going to think when she finds out she's been posted on two blogs?? This is my 12x12 layout of my littlest boys first car. Hi I hope everyone has enjoyed the beautiful weather this weekend. Just letting you all know that I've created a separate email address for this blog. The new address is nzsublog@xtra.co.nz and is accessable to all the admins. So if you want to enter challenges, have pics posted or to nominate blogs for Inspiration or Blog of the Week or just to contact us please email us at the new address. Everyone's been busy getting organised for Christmas. 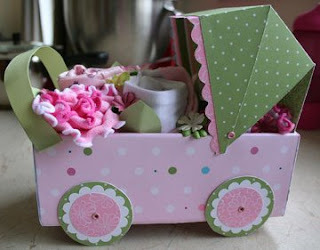 Catherine's made this cute as little box using the very popular Season of Joy set. Check out Catherine's blog HERE. 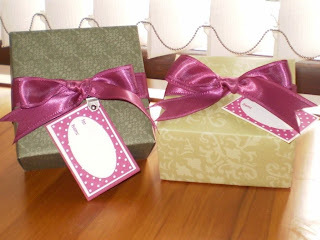 Angela has made these very cute boxes. Just one question Angela, how do you get your bows looking so good? Mine always come out lopsided. This is a 2,5,7,10 box made with Dashing dp and fun & fast notes. 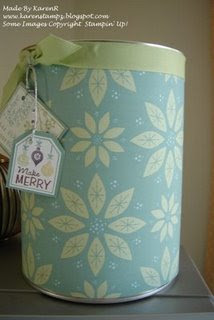 This is one of the projects at "Louise's Christmas Chaos". For more information check out "Louise's Blog"
We've had a quite a few demo's starting blogs recently so I thought i'd say welcome to NZSU to all of you. Thank you for sharing your creative talent with us all. Just a couple of notes on how this blog runs. Challenges don't have a set closing date. If you feel inspired to enter into a challenge you can email me or Louise a pic or link at anytime and we'll post it. Unfortunately because life gets busy with children and work and workshops and stamping etc... Challenges are rather random - there's no Colour Challenge Monday, Skectch Challenge Tuesday etc... Anyone can enter a challenge, demo's and customers and you don't have to have a blog to enter. We welcome your feedback, if you have any suggestions or ideas, please don't hesitate to let us know. Also if you think a blog or project has inspired you, you can nominate it as a 'Blog of the Week' or 'Inspiration', just email us the details. Thank you to everyone for supporting this blog, it's been great watching it grow and seeing everyone develop their stamping talent over the year! Here's my entry - don't forget to leave a comment on my blog for some Blog Candy! I received these via email this morning and Dely's said I could choose either picture. I love both, so I'm posting both. Check out Dely's blog Little Scraps of Paper. Also a big congrats to Delys for making the Elite Team for Up 2 Scrap - she'll be published in every issue! Make sure you grab a copy! Karen was very fast at email me her entry for the challenge. Karen is also wonderful at leaving comments on blogs. Thank you Karen for all your encouragement. Check out Karen's blog and I'm sure she'd love it if you left a comment for her. I've got Blog Candy on offer. Check out my blog Made By Me for details. You could receive one of these boxes filled with something scrummy! I finally got it made and then it took a few days to get a photo of it - and not a good one at that. Anyway here it is. Love Tracy's colouring on this card! 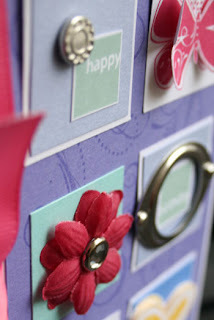 Check out her blog Stamping All Seasons. How bad is that?? I've set a challenge and as yet still haven't found the time to participate yet!! Hopefully tomorrow after I've been inspired at our monthly downline meeting. Anyway, Tracey has managed to create this stunning card. Check out Tracey's blog by clicking HERE. 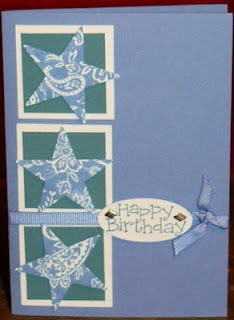 Here's Amy's CC2 card - check out her blog by clicking on the link HERE. Isn't this just the cutest thing ever??? I came across it very late last night, and just knew it had to be an inspiration post. For more details check out Sharlene's Blog. 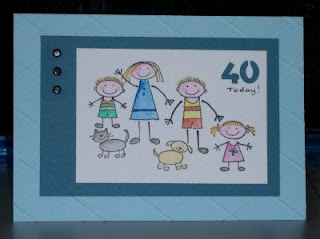 This weeks "Blog of the Week" is Tracey Old and her blog "A Stampers Touch". 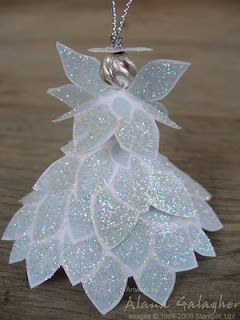 I really enjoy visiting Tracey's blog as she has the most gorgeous projects and cards. Tracey is one talented lady. What is your favourite stamping accessory? My favourite accessory would have to be embellishments love them all, ribbon, brads, hodgepodge, punches any thing to add a little something to my project. What is your favourite SU colour line? Earth elements would be my favourite colour range. What inspires you? Love looking through blogs to see what other people create, they inspired me to set one of my own up. I highly recommend going and checking out Tracey's blog and taking some time to have a look at her stunning projects. Hi everyone. I just wanted to share some of the photos from our World Card Making Day even we held last Saturday. It was heaps of fun, lots of cards were made and best of all we raised some cash for Starship. 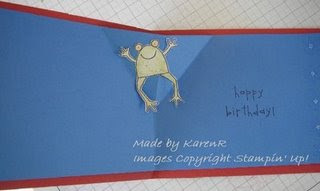 Karen managed two challenges with this hoppin' cute card. It the perfect card for a child and she's used the colours from the latest KWerner colour challenge. And checkout the pop-out inside! Go pay Karen a visit on her blog The INKredible Journey. I chose Anna Sutherland for this week. She's fairly new on NZSU so this is a great opportunity to get to know Anna a little better, and I love her 'clean & fresh' style. If you haven't already, visit her blog Funky, Fresh & Fun. 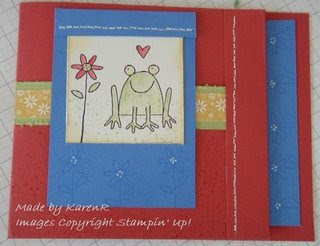 How long have you been stamping and how did you get started? I started stamping just over 3 years ago when I was pregnant with my son Connor. I went along to a couple of classes with my mother in law and was hooked from that point on. What's your favourite Stampin' Up! product? I don't really have a favourite product as I tend to want it all. If I had to choose though I think that it would be the gorgeous ribbon. My main source of inspiration is all you talented people out there with blogs. Thanks Anna for sharing all your creations with us. Remember everyone, anyone can nominate a blog for Blog of the Week, just email either Louise or Trudi with the name of the blog and the reason you're nominating it. I wanted to share the card I made for my Grandmother's birthday today. For the recipe check out my blog Made By Me. Wow!! Three cards in one day! Everyone's been busy making birthday cards. Stevie's is the latest entry and she's made a fun card for her husbands birthday. Check out Stevie's blog HERE. Isn't it the cutest! Having girls I'm a little biased. 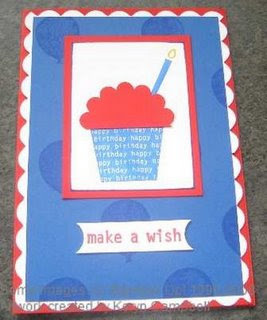 Sharlene made this card for Nicole who's turning 6 and also enjoys stamping. To see the full card and the recipe check out Sharlene's blog Magpie Creates. Isn't it a nice feeling when someone likes your creations enough to case them. Lisa's cased a card of mine and changed it into a birthday card and she done a great job. Check out Lisa's blog for the recipe HERE. Isn't this card so cool. Anna made this for her son Connor who's now three - they grow up so fast don't they. I'm sure he'll love his card and I'm sure it'll be cased for all the Thomas fans out there. For the recipe and to see more of Anna's creations check out her blog Funky, Fresh and Fun. Keryn's managed to complete two challenges with this card, one for her Daring Cardmakers Team by using scallops and the birthday theme for us. For the recipe check out Keryn's blog Keryn's Cards. I made this card today and have only just clicked I can enter it into this months challenge. I've used the retired SAB set Birthday Whimsey. See my blog Made By Me for the recipe. Trudi and I have decided to bring back the blog of the week due to all the fantastic new demos and their blogs popping up around the country. So without further ado the first blog to recieve the huge honor of being the NZSU Bog of the Week is "Chloe Danz Independent Stampin'Up Demo". Chloe is from Wanganui and she has been a demo since August. How Long have you been stamping? Since my daughter was born almost a year ago: I all of a sudden needed a zillion thank you cards; and I had a little time on my hands (strangely enough: she is a cruisy baby!) hence this little habit was born! Who if anyone is an influence in your stamping? Really anyone with a 'clean and simple' style: Kritina Werner (http://www.kwernerdesign.com/blog/) and Dawn Mcvey (http://dawnmcvey.typepad.com/) in particular. What is your favourite stamping accessory? Mmm I'm a ribbon kinda gal, but I also can't live without my dimensionals! What is you favourite SU colour line? Chocolate Chip, if I really had to choose one!! Also real red, and I'm loving Kraft lately too. Chloe's cards are fantastic with clean lines and great design. Go and check out her blog! Here's Lisa's shoe - she's done hers a little different, using DSP. And although Lisa say's she had trouble with it I think she done a fantastic job!!! LOVE the bling!! Check out Lisa's Blog and see all the scrapping she's been up to lately. Isn't he just the cutest?!! 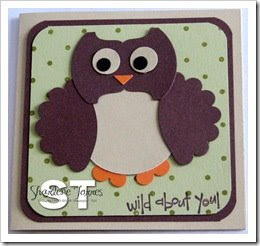 I happened to 'hop' onto Sharlene's blog and she's made this cute little owl card using punches. 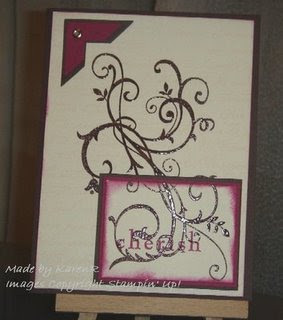 Here's Karen's entry for the Embossing Challenge. Her upline's very lucky to be receiving this for her birthday. Check out the close up on Karen's blog The INKredible Journey. 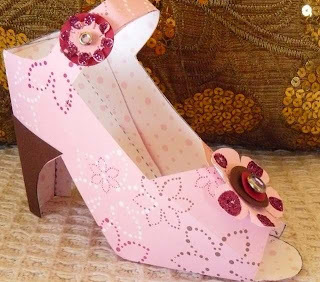 Susan's still busy making shoes - this one is also very cute, perfect for Spring. 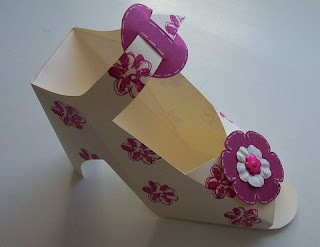 I've made another shoe but unfortunately I've given it away without taking a photo. You'll all have to enjoy Susan's instead.